April 5, 2018 (San Ramon, California) – Great Place to Work and FORTUNE honored ENGEO Incorporated as one of the 2018 Best Workplaces in the Bay Area. ENGEO took the 3rd spot on the list of small and medium size companies. The ranking considered more than 43,000 employee surveys from companies across the San Francisco Bay region. Great Place to Work, a research and consulting firm, evaluated more than 50 elements of team members’ experience on the job. These included employee pride in the organization’s community impact, belief that their work makes a difference, and feeling their work has special meaning. Rankings are based on employees’ experiences, no matter who they are or what they do. 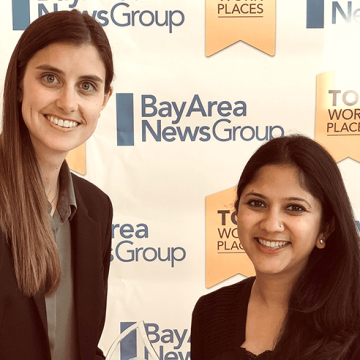 ENGEO attributes their success in attracting amazing talent in the Bay Area to several factors, including nomination by employees as a Best Workplace. Through their unique group interview process, candidates get a true sense of what it’s like to work at ENGEO and candidates hear the ENGEO story first hand from various levels of the company. The company promotes healthy living and the flexibility to work in different offices to support a variety of projects. The Best Workplaces in the Bay Area stand out for thriving in the competitive Bay Area marketplace. ENGEO is headquartered in San Ramon, California, and now has 5 Bay Area offices. The Best Workplaces in the Bay Area is one of a series of rankings by Great Place to Work and FORTUNE based on employee feedback from Great Place to Work-Certified™ organizations. ENGEO has consistently ranked as a Best Workplace for 13 years by SF Biz Times, Bay Area News Group, Society for Human Resource Management (SHRM), Entrepreneur Magazine, Great Place to Work and FORTUNE.